Ok, am overdue getting all these photos uploaded to the blog. So let’s start, shall we…. Santa Mountain, so named as one can see a side view of Santa from peak looking to your left in this picture. He’s laying down, you can see his rim of hat, forehead, nose, beard, even his knees and the toes of his boots. From the peak to the right, which isn’t quite obvious yet is his hat. The snow needs to melt a little more for the complete hat to show itself. And this was taken on our start of summer. 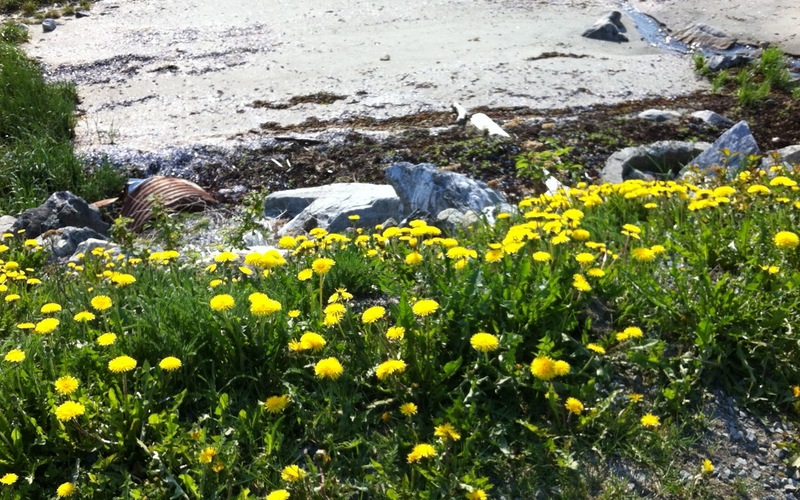 We skipped Spring altogether and the sun shone brightly and warmed the air. Beautiful day! Not much to speak of, other than we are looking up at Mt. Ripinski. Its a well hiked trail that leads up there. If I get a chance to hike it, will take pictures. 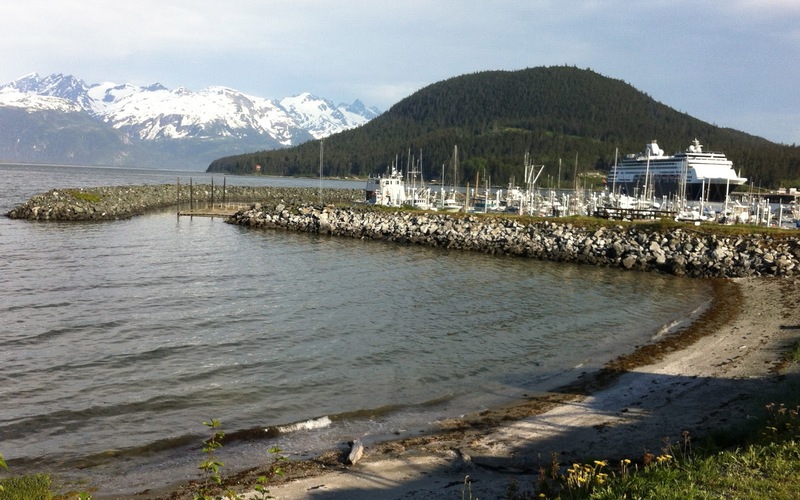 The mountains viewed here are the coastal mountains between Haines and Yakutat – Glacier Bay area. Will show more of these mountains later in this series of photos. Road leading up to town. The park is 13 ft above sea level, the town has a nice cushion from trouble. Yes, that is the back side of my rig. They were painting the main office and store building and we all had to move away. I parked in front of the road, but in after thought – if someone lost there brakes coming down that hill, I would be in the way as they slid into the ocean. Brew fest weekend was wild, but everyone seemed to have a good time. Most of our park was booked with Canadians. They make reservations well in advance to get a spot at our place here, as it goes quickly. As it was, we had people begging us to allow them to stay. The RV park closest to the fairgrounds where the Brew Fest was held – was booked solid with tents. Its really dark, shrouded under the big trees there. And one other RV park close to the fairgrounds – does not allow party outside of one’s rig and they dictate who can come visit you. So they were almost completely empty for the Brew Fest. 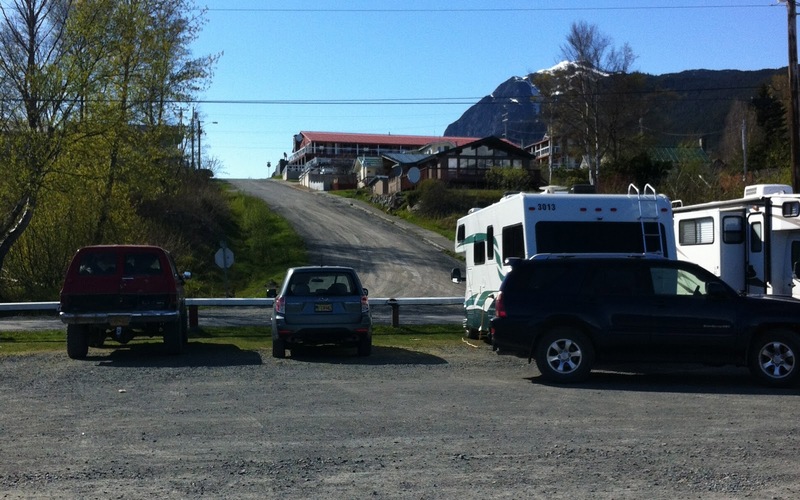 The two State Parks – far out of town, were full, but folks drinking didn’t want to make the drive. 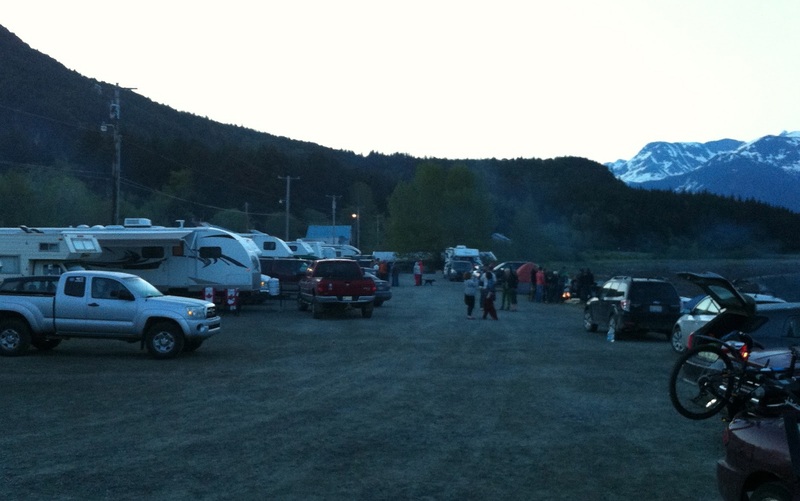 And truck campers and a few RV’s lined the roads to park and tents were on the beach. Live music was had in at least two places in town, bars were hopping but it seemed like an organized party to me. Well planned fun. 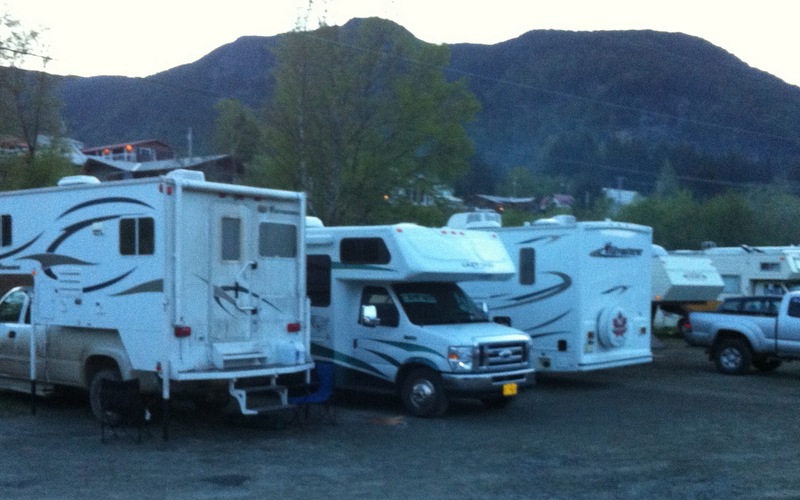 My rig sandwiched between 2 other rigs due to tents added to their RV space. I allowed that, but it got a little crazy by morning, with the Bailey’s covering my rig, wine too – but it all washed off, so is ok. 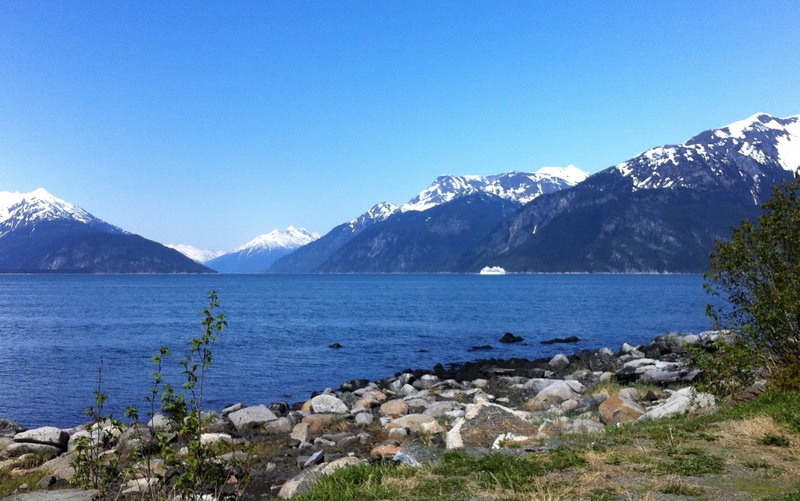 This view is across the bay from Haines looking North, Haines is to left out of this picture. 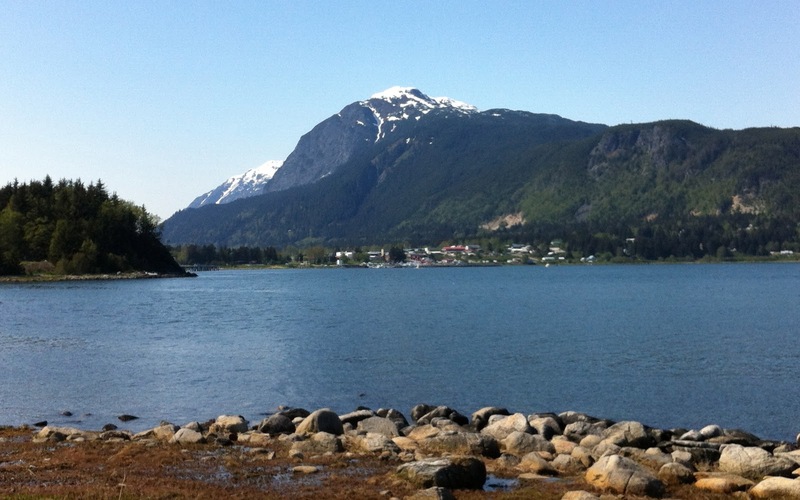 The cruise ship is coming from Skagway, heading South to Juneau. Skagway gets 4-5 cruise ships a day. Its a big tourist town. 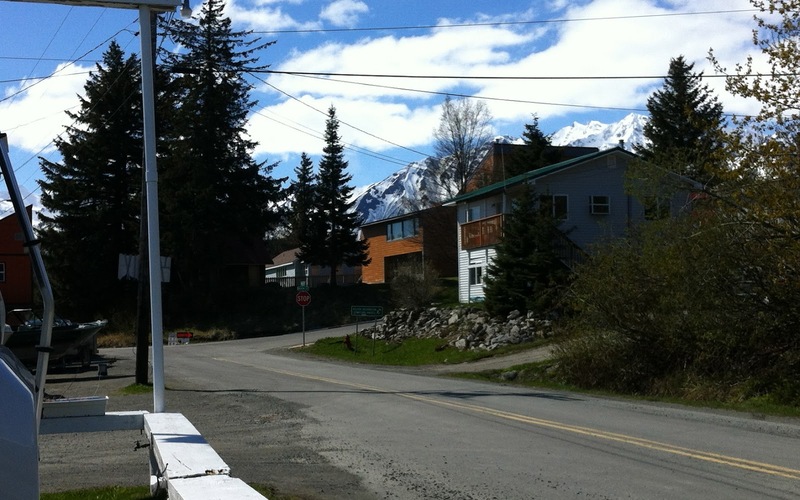 This view, cuts off Fort Seward to the left of Haines, which is all part of this town. 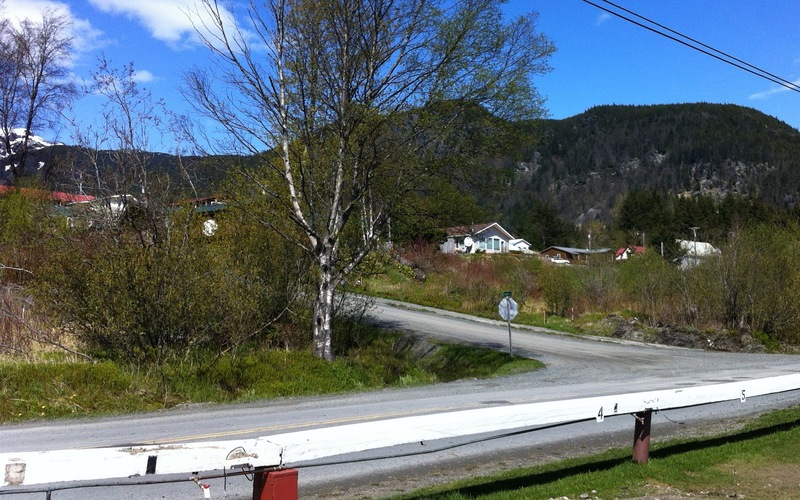 For those that have been here, we are on our way to Battery Point – a nice hike! 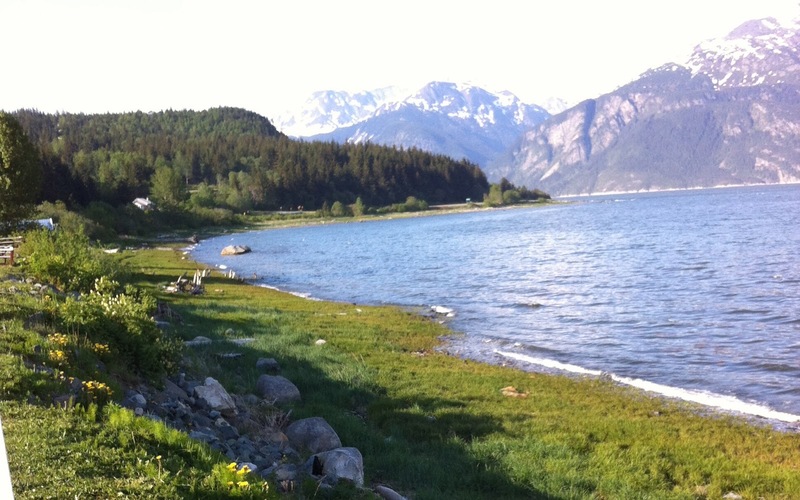 Looking back at Haines, that is Mt Ripinski right behind it. Full moon brought high and low tides, the cruise ship and a ton of fish. We’ve been waiting for the fish to arrive and it will be slow going for points north of us as well. Why? Our waters have been too cold until now. Who would have thought that! But the fish have arrived, which has brought the whales. Frequently, see orcas out here rollicking in our bay and/or just feasting on the bounty of the sea. Love to watch them in the wild. It can keep me mesmerize for hours. Highest of high tides. No beach to be found. 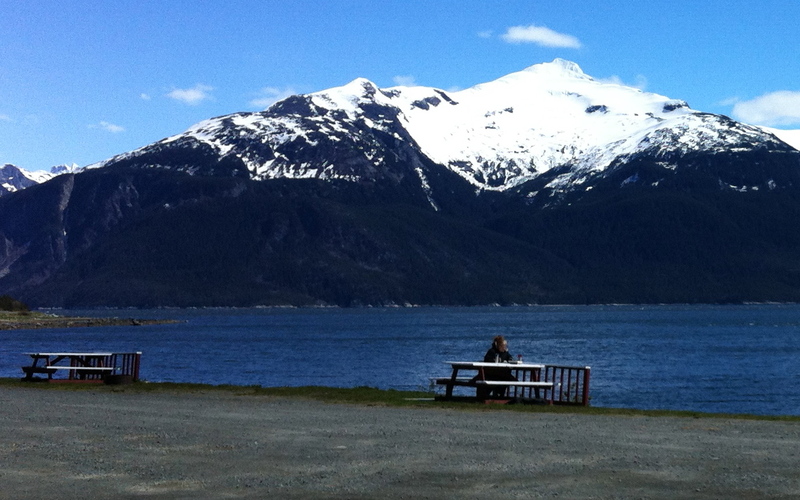 Where Chilkat River meets the ocean. 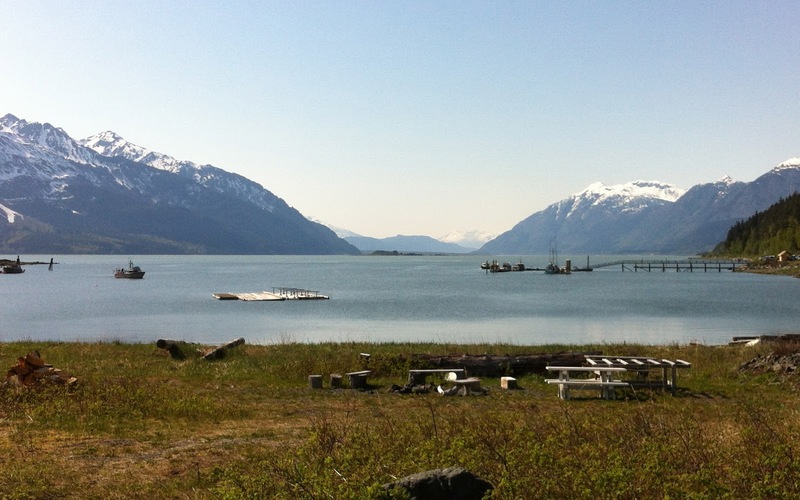 Chilkat River is what one follows as they enter Haines from the North. It is also the river internationally known for the eagles. But in this picture, I am about 40 miles south of where the road follows the river. 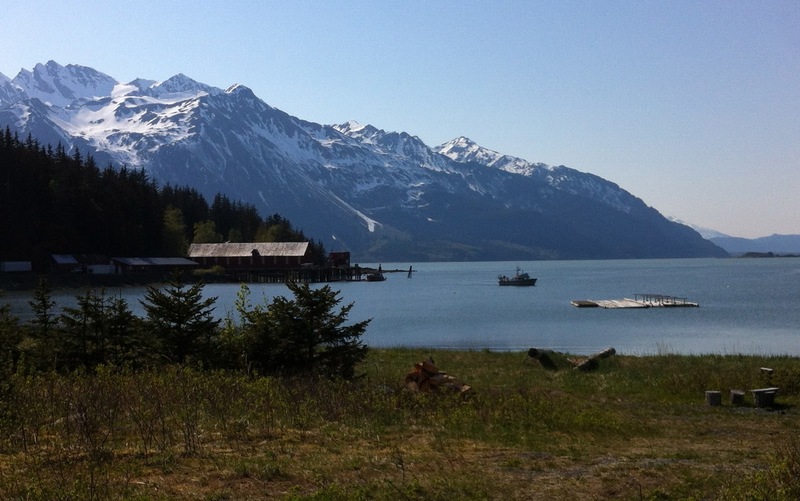 At this view, the Chilkat River has met the ocean. 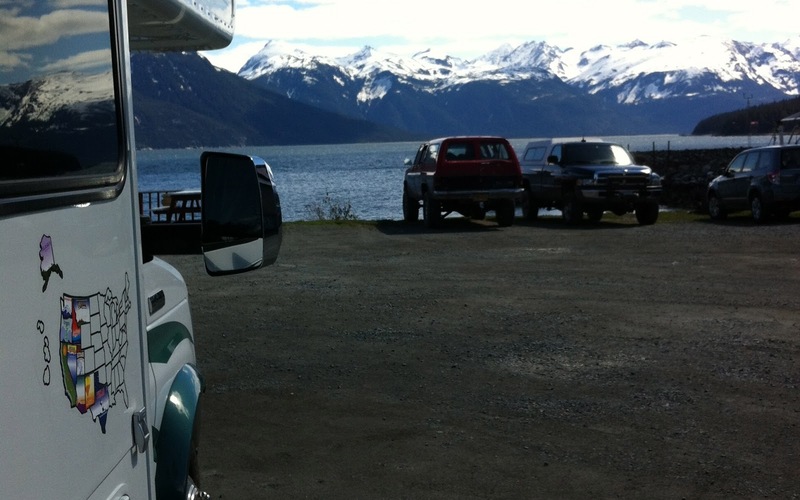 We followed Mud Bay Road out to this small boat harbor – for private boats mostly. To the left (and in picture below) is the cannery. The mountains on the left are the Coastal mountains. There is a floating dock near the shore, which was told is used to unload crab and such. I’ve never seen it used in all the years I’ve been coming here.